Swarms of flying ants inside your home can be the first sign of trouble. Like their name suggests, moisture ants love living in damp, humid environments. The Pacific NW is their ideal, which makes infestations here relatively common, especially during spring. 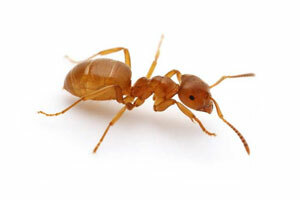 Carpenter ant infestations are associated with rotting or water-saturated wood in homes. Spring is when moisture ants swarm. “Swarming” refers to the process by which a percentage of a colony leaves to form another colony. This happens with some other insects, including bees, carpenter ants, and termites. If you see a swarm of flying ants in your home, you may have a serious moisture ant problem! It’s crucial at this stage to get professional help, because these ants could be any number of species, including carpenter ants. If you’re not familiar with the difference between ants and termites, it’s even more important to get a professional opinion. Where do moisture ants come from? Unlike carpenter ants, moisture ants will eat damp wood as a food source. These ants thrive in walls around plumbing fixture leaks, roof leaks, and any other source of water that has made wood damp. They will also eat sugary substances, which makes them an even greater threat to homes and businesses. If left unchecked, moisture ants will continue growing their colony. The damage caused by moisture ants can be extensive. Just like carpenter ants or termites, moisture ants can do significant damage to the structure of your home. Depending on the location of the initial leak, the colony could grow to substantial numbers within a year. To get rid of moisture ants, you need to remove the infested wood and control the moisture issue, whether it’s a leak or exposure to the elements. This could mean replacing a small section of your outside wall, or it could mean replacing an entire section of your roof. A professional exterminator can help diagnose your moisture ant problem, and recommend steps to treat and control infestations in the future. Get rid of moisture ants for good. The remedy starts with finding exactly where the moisture is coming from. Proper inspection involves checking roofs, basements, plumbing, and crawl spaces to find the location of both the nest and the source of moisture. Even after the wood decay is found, inspection should continue to be sure all areas of the home are thoroughly investigated. If you’ve had a swarm of flying moisture ants, it’s even more important to find all possible locations of nests and remove them. Moisture ants can be hidden nearly anywhere in your home, including in inaccessible areas, wall voids, roof sheathing, or enclosed sub floors. Remove all decayed wood and eliminate sources of water. Regular inspection should then be scheduled, to make sure the problem doesn’t return. It can be especially helpful to work with either the same company that treated your house initially, or produce documentation for another company to follow. The best way to avoid a moisture ant problem is to prevent it. Pest maintenance plans are a great way to avoid pest problems. When you work with a professional pest company, they can inspect your home, showing you any areas that are vulnerable to insect infestation.